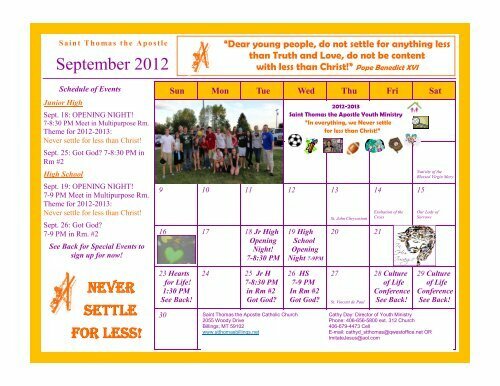 Saint Tho ma s the Apostle September 2012 Schedule of Events Junior High Sept. 18: OPENING NIGHT! 7-8:30 PM Meet in Multipurpose Rm. Theme for 2012-2013: Never settle for less than Christ! Sept. 25: Got God? 7-8:30 PM in Rm #2 High School Sept. 19: OPENING NIGHT! 7-9 PM Meet in Multipurpose Rm. Theme for 2012-2013: Never settle for less than Christ! Sept. 26: Got God? 7-9 PM in Rm. #2 See Back for Special Events to sign up for now! NEVER SETTLE FOR LESS! Sun Mon Tue Wed Thu Fri Sat 2 3 4 6 7 9 10 11 12 13 16 17 18 Jr High Opening Night! 7-8:30 PM 23 Hearts for Life! 1:30 PM See Back! 30 “Dear young people, do not settle for anything less than Truth and Love, do not be content with less than Christ!” Pope Benedict XVI 24 25 Jr H 7-8:30 PM in Rm #2 Got God? Saint Thomas the Apostle Catholic Church 2055 Woody Drive Billings, MT 59102 www.stthomasbillings.net 2012-2013 Saint Thomas the Apostle Youth Ministry “In everything, we Never settle for less than Christ!” 19 High School Opening Night 7-9PM 26 HS 7-9 PM In Rm #2 Got God? St. John Chrysostom 14 Exultation of the Cross Nativity of the Blessed Virgin Mary 15 20 21 22 27 St. Vincent de Paul 28 Culture of Life Conference See Back!  Our Lady of Sorrows Cathy Day: Director of Youth Ministry Phone: 406-656-5800 ext. 312 Church 406-679-4473 Cell E-mail: cathyd_stthomas@qwestoffice.net OR ImitateJesus@aol.com 29 Culture of Life Conference See Back!